Former President and now Speaker Gloria Macapagal-Arroyo visited Friday some areas in Central Luzon affected by the recent weather disturbances. 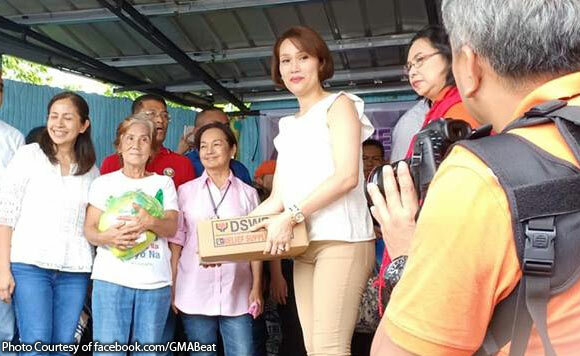 Arroyo went to coastal town of Sasmuan in Pampanga and distributed relief goods. After Sasmuan, she went straight to another relief operations in Brgy. Pinulot, Dinalupihan, Bataan, one of the areas worst hit by the recent typhoon. In Bataan, Arroyo was accompanied by Bataan 1st District Rep. Geraldine Roman. According to her Facebook page, Arroyo, upon assumption as House Speaker, vowed to help the districts in the country badly hit by the two two tropical storms and a tropical depression during the past weeks. Arroyo took over the speakership Monday, July 23, by ousting Davao del Norte Rep. Pantaleon Alvarez.